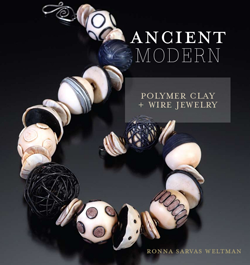 Artistically combining polymer clay with wire, this distinctive manual teaches crafters and jewelry makers how to create organic, sophisticated, and contemporary jewelry. A range of innovative techniques in designing beads and components from polymer clay are combined with wireworking elements, inspired clasps and ear wires, wire bead caps, polymer clay tipped head pins, and more for a signature look. Explaining fundamentals of jewelry design, this manual also delves into what makes a piece �primitive” and how to achieve an organic effect through color mixing and textures. Included are a wide variety of polymer clay and wire jewelry design and texture techniques, 15 one-of-a-kind detailed projects, and a gallery of completed works.